Last week it was reported that Donald Trump’s White House Press Secretary Sarah Huckabee Sanders was preparing to resign. She denied this, but since that time, she’s begun steadily backing away from the job. Palmer Report pointed out earlier that she’s heavily scaled back her presence on the official @PressSec account on Twitter. Now it turns out she’s gone AWOL in the real world too. He included a photo of some reporters working out of a half empty briefing room, while someone was casually leaning against the podium for support, as sign of just how long it’s been since the podium has been used for any briefings. 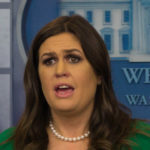 Of course the question is whether White House press briefings have come to an end because the Trump regime is hiding from the child cage scandal, or because Sarah Huckabee Sanders is too uncomfortable with the scandal to be willing to go out there and lie about it, or some combination of both. Either way, at this point, the White House press briefings are no longer a thing, and the White House Press Secretary has gone AWOL. She can deny all she wants that she’s preparing to quit her job, but this isn’t how anyone behaves if they’re planning to remain on the job. Come to think of it, why isn’t her Deputy, Raj Shah, doing the briefings in her place? Of course it’s been reported that he’s preparing to resign as well.